Thank you Edu Hero for believing in the power of I CAN and enabling your children to discover their I CAN superpower through the FIDS process. Now is the time to reflect on their journey of change and identify their learnings through the Do stage. You can lead the children to make a journey map of their experiences till date. 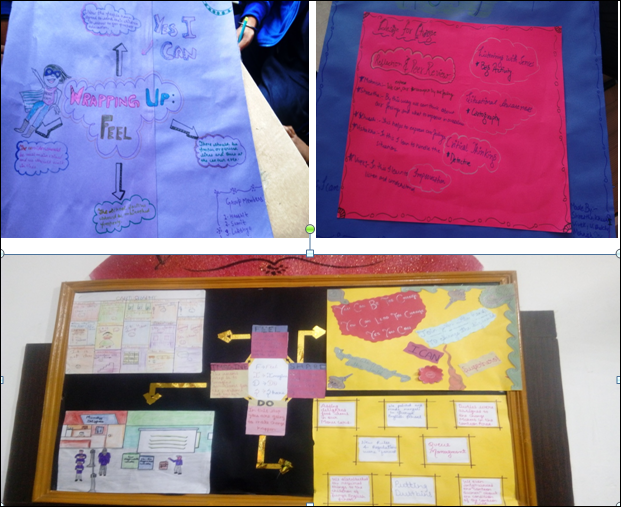 Through a journey map, children can visually express their experience from the beginning with highlights, evidences, quotes from each stage of the process. The shift is not just about the impact children were about to bring in their hotspot but also the changes they noticed in themselves and their team. Thus, the reflection is both within and outside. As shown in the workbook, on a scale of 1 to 10, let the student rate their act of change. Further, ask some of the students to substantiate their rating with evidences. You can push the student to think about specific moments where they observed a change in the scenario. A great way of understanding the impact is to connecting it to the detective step where the children became silent observers to observe user behaviors in a normal scenario. If time permits, you can get the students to visit their hotspot and observe the magnitude of change they have been able to bring. Get the children to share the feedback they received from the users. They can sit with their respective teams, discuss the feedbacks received and share it with the whole class. What did you find easy about learning to …? How would you do things differently next time? What did you find difficult while you were learning to …? What helped you when something got tricky …? Alternatively, you can use prompts to get them to think of various aspects of their experience. You can also get the groups to list down the hotspots and bright spots in the implementation. You can also use some of the reflection strategies shared in the Imagine reflection page. Once the children have done the sharing, get them to work on their reflection and peer review. Since the students have planned and worked collaboratively in the Do process, the questions are designed to help them to reflect on their personal growth through the process. A peer feedback not only enables the children to look at their growth through a different perspective, but also fosters closer bonding within the class where they start adding value to each other through positive feedback. As you close the session, get the students to highlight the happiest and proudest moments as a class. This allows them to connect the dots on how each person in the class has added to achieving their act of change.